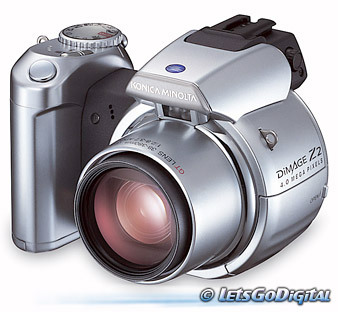 The DiMAGE Z2 is the second in a series of easy-to-use SLR-type digital cameras and a step up from the DiMAGE Z1. The DiMAGE Z2 also boasts the Rapid AF (Auto focus) and is now offering world's first SVGA (800x600 pixels) movie recording option! Konica Minolta has raised the bar with the adoption of a GT lens and a 4 Megapixel resolution, delivering picture clarity at the very top end of the spectrum. The addition of a Predictive Focus Control has increased the speed of the AF function, which means that when you are shooting sports events or any moving object, you'll never miss a thing. With its 4-megapixel resolution, the DiMAGE Z2 will appeal to users with a slightly more developed appreciation of high-resolution photography. Fine Image Quality with the Mega-zoom: It's no coincidence that the groundbreaking DiMAGE Z2 is the first Konica Minolta digital camera to be equipped with the new Mega-zoom featuring the all-glass apochromatic (APO) lens. This impressive zoom delivers a focal range equivalent to a 38 to 380mm range on a 35mm camera lens. Combining the 10X Optical Zoom of the GT Lens with the 4X digital zoom gives the DiMAGE Z2 a 40X total zoom range. Konica Minolta GT Lens: The DiMAGE Z2 sports the GT lens, the finest all-glass apochromatic (APO) zoom lens designed specifically for digital photography. The GT lens is the leading lens designed by Konica Minolta for digital cameras. The reputation of a lens is defined by one thing: image quality. The GT lens benefits from Konica Minolta's original technology for minimizing various types of imperfections, such as colour aberration. The DiMAGE Z2 user will notice the benefits of the APO lens immediately: every single shot comes out sharper, clearer, and without any colour aberration, even when using the large aperture setting. The lens is the heart of the camera and this GT lens has 11 elements in 7 groups. The APO effect is delivered by anomalous dispersion (AD) glass elements to ensure maximum colour fidelity and aspheric elements to suppress distortion at the outer edges of an image. Rapid AF with Predictive Focus Control: Predictive Focus Control keeps a clear focus on fast-moving subjects until you're ready to shoot. It calculates exactly where a moving subject is going to be at the moment of shutter-release, and makes certain that the focus is razor sharp. Also, the DiMAGE Z2 employs Rapid AF, the only camera in its class (The DiMAGE Z2 is the only camera featuring Rapid AF with Predictive Focus Control among digital cameras with a built-in zoom lens with 10X or more optical zoom, as of January 1, 2004), to ensure sharp images with minimum delay. The DiMAGE Z2's powerful optics and high-resolution, 4 Megapixel 1/2.5 interline primary-colour CCD require a powerful AF system. A passive AF sensor locks on to the moving subject and calculates the distance to the subject, causing the Rapid AF to react and adjust itself. The focus point is determined in relation to the camera CCD. In the blink of an eye, a high-speed drive focuses the lens quickly and smoothly. Real Motion LCD monitor and Switch Finder: The DiMAGE Z2 features the Real Motion LCD monitor, which delivers crystal clear images to the user with a 60 frames per second rate. Conventional monitors on digital cameras use a 30-frames-per-second display format that sometimes results in a less-than smooth display. The 60 frames per second Real Motion Monitor rate gives smooth action that brings images to life. The LCD monitor on the DiMAGE Z2 can be viewed directly or through the viewfinder, thanks to Switch Finder. There is no colour, contrast, and resolution difference between separate rear and viewfinder monitors because only one monitor is used. The monitor image is large and clear as the viewfinder was designed with a large apparent angle of view. Long Caption (Progressive Capture): With the DiMAGE Z2 on Progressive Capture mode, when you cease pressing the shutter-release button, your images are saved automatically. Progressive Capture means that it's the last several images in the sequence get saved: as many as 6 images (4 Megapixel, Fine mode) or 12 images (UHS continuous shooting mode). So when you are shooting fast-moving objects, Progressive Capture will ensure that they are recorded when and where you want them. Super-Fast UHS Continuous Shooting: Regardless of how fast something is moving, the DiMAGE Z2 can capture everything. Select the UHS (Ultra High Speed) option from the rapid shooting menu. The enlarged 32MB internal memory allows more continuous shooting. The DiMAGE Z2 captures 15 images, 10 frames per second at super-fast UHS continuous shooting mode. PASM Exposure Control and Metering Modes: The DiMAGE Z2 offers incredible control over exposure. There are four modes: program, Aperture Priority, Shutter Priority, and Manual. Select manual exposure to enable the 30-second time exposures. The DiMAGE Z2 has three metering modes: multi-segment, center-weighted and spot. Multi-segment metering uses 256 segments to determine exposure. High-Quality VGA/SVGA Movies: Of course, the DiMAGE Z2 is not limited to capturing still images. Offering the kind of image clarity hitherto only seen on digital video cameras, the DiMAGE Z2 can record high-quality 30 frames per second VGA (640 X 480) movies. The VGA 30 frames per second are as clear and as smooth as the moving image on a television. Try the world's first 15 frames per second SVGA (800X600) movie option and you will see that you are only limited by your imagination. Viewed on a PC the SVGA movie delivers approx. 6.3 more pixels than the standard QVGA (320 X 240) format favoured by other digital cameras. You can keep recording until the memory card is full. Image sharpness and brightness are crucial when capturing movies. This is doubly true for the DiMAGE Z2 because it can capture large, high-quality VGA (640X480) movies. The DiMAGE Z2 always maintains the sharpest focus. The Night-Movie mode can make colour recordings under extreme low-light conditions. Edit on the bounce with the DiMAGE Z2: Editing with this new function couldn't be simpler. Select the scene you wish to cut from the footage being replayed and save the edited version using the Movie Select Shot Function. Unwanted movie footage is removed, freeing up valuable memory space. These saved movie images can also be processed with one of the Color Modes: vivid, natural, black and white, or sepia. Wide-Angle Converter (option): The DiMAGE Z2 can handle wide shots even with its 10X Mega-zoom. To extend the versatility of the powerful 10X Mega-zoom, an optional 0.75X wide-angle converter is available for the DiMAGE Z2. This lens attachment increases the lens' angle of view, giving it a maximum coverage approximately equal to a 28mm lens on a 35mm camera. The adapter ring supplied with the wide-angle converter allows 52mm filters to be used with the camera. Real-Time Histogram Display: The new DiMAGE Z2 is equipped with a real-time histogram function. A luminance reading can be displayed on the DiMAGE Z2's viewfinder before the picture is taken or while playback. With the Histogram Display, the DiMAGE Z2 will inform you of the luminance distribution at a glance. The Histogram Display also adjusts brilliance when viewing pictures and movies from the memory. Flash Compatibility: No other digital camera on the market today has a flash as powerful as that of the DiMAGE Z2. When the DiMAGE Z2 is set at the wide-angle position with auto exposure and auto camera sensitivity, even if the subject is standing 6m (20ft) away, the flash, rated with a guide number of 12 in meters (39 in feet), can illuminate the subject perfectly. The DiMAGE Z2 is equipped with a flash unit that will literally light up your pictures. But if it's even more flash power you require, consider the Konica Minolta Program/Maxxum Flash 3600HS (D) or 5600HS (D) units as well as the latest addition to the line, the Program/Maxxum Flash 2500 (D). All of these incredibly versatile and powerful flash units are compatible with the DiMAGE Z2. Automatic Digital Subject Program Selection: The DiMAGE Z2's Automatic Digital Subject Program Selection analyzes the shooting conditions and selects from among five subject programs and programmed AE to optimize the camera's exposure, white balance, and image processing controls. The five subject programs are portrait, sports action, landscape, sunset, and night portrait. Key Customization: Operation of the DiMAGE Z2 can be tailored to meet the photographer's needs. For example, the function set using the flash-mode button can be customized to control the flash mode, white balance, drive mode, focusing mode, or colour mode. White Balance Control: Auto White Balance compensates for these changes automatically. Select from one of five preset white-balance settings: daylight, cloudy, tungsten, fluorescent, and flash. The names of the settings refer to specific light sources. The DiMAGE Z2 allows for critical control over colour. Select the custom setting to calibrate the DiMAGE Z2 to the particular lighting conditions at the scene. Other features are: Automatic Monitor Amplification, Rotate Function for pictures, Noise Reduction Function, PictBridge support, Manual focus, Long battery life with NiMH 4xAA batteries and Super Macro mode of 3cm.